Donna Douglas (born Doris Ione Smith; September 26, 1932 – January 1, 2015) was an American actress and singer, known for her role as Elly May Clampett on The Beverly Hillbillies (1962–1971). Following her acting career, Douglas became a real estate agent, gospel singer, inspirational speaker, and author of books for children and adults. Douglas was born Doris Ione Smith in the community of Pride, East Baton Rouge Parish, Louisiana, on September 26, 1932. The younger of two children, she was the only daughter of Emmett Ratcliff Smith, Sr.[note 1] and his wife, Elma (née Robinson). [note 2] Her birth name is listed both as Dorothy Smith and Doris Smith in various articles. Douglas attended St. Gerard Catholic High School, where she played softball and basketball and was a member of the school's first graduating class. Douglas was named Miss Baton Rouge and Miss New Orleans in 1957. Douglas moved to New York City to pursue a career in show business and started as an illustration model for toothpaste advertisements. She was featured as the "Letters Girl" on NBC's The Perry Como Show in 1957 and as the "Billboard Girl" on NBC's The Steve Allen Show in 1959. These and other television appearances led New York photographers and newspaper reporters to award her the "Miss By-line" crown, which she wore on CBS' The Ed Sullivan Show. Hal B. Wallis saw the Sullivan episode and cast her in the role of Marjorie Burke in the movie drama Career (1959), starring Anthony Franciosa, Dean Martin and Shirley MacLaine. This was followed by a bit part in the musical comedy Li'l Abner (1959) and the role of a secretary in the comedy/romance Lover Come Back (1961), starring Rock Hudson and Doris Day. She made numerous television appearances in the late 1950s and early 1960s, including The Twilight Zone episode "Eye of the Beholder" (1960). She played Barbara Simmons in four 1961 episodes of the CBS detective series Checkmate. Her other credits included in U.S. Marshal, Tightrope, The Adventures of Ozzie and Harriet, Bachelor Father, Adam-12 and Route 66. Douglas also appeared in Thriller, season 1, episode 16, "The Hungry Glass". Although Douglas was an active actress in the 1960s, she was still relatively unknown when selected from among 500 young actresses to work on The Beverly Hillbillies. This series ran for nine consecutive seasons, beginning in 1962 and ending in 1971. Continually typecast as a result of her Hillbillies role, Douglas decided to focus on her career as a gospel singer. During the 1966 summer hiatus of The Beverly Hillbillies, Douglas made her only starring feature film appearance, cast as Frankie in Fred de Cordova's Frankie and Johnny (1966) with Elvis Presley. The film proved popular but it did little to advance Douglas' big-screen career. With the 1973 death of Hillbillies co-star Irene Ryan, and Max Baer Jr.'s refusal to participate, Douglas joined Nancy Kulp and Buddy Ebsen in 1981 as the only original cast members to appear in the reunion movie Return of the Beverly Hillbillies. Douglas was a guest star on a number of other television programs and the subject of paper dolls, dolls, coloring books, and various toys during the height of the show's popularity. In a 2003 interview with "Confessions of a Pop Culture Addict", she summed up her views on the role: "Elly May was like a slice out of my life. She is a wonderful little door opener for me because people love her, and they love the Hillbillies. Even to this day it's shown every day somewhere. But, as with any abilities, she may open a door for you, but you have to have substance or integrity to advance you through that door." In 1992, Douglas and Baer attended Buddy Ebsen's 84th birthday celebration in Beverly Hills, California. In 1993, Douglas, Ebsen, and Baer reunited on The Jerry Springer Show, and for a final time in a CBS-TV television special, The Legend of The Beverly Hillbillies. In December 2010, Mattel released a new collection of three Barbies called the Classic TV Collection. These dolls were Samantha Stephens (from Bewitched, played by Elizabeth Montgomery); Jeannie (from I Dream of Jeannie, played by Barbara Eden; and Elly May Clampett. Douglas received her real estate license after The Beverly Hillbillies finished production. She did not work in that field long, however, as she remained in show business and found other projects. Douglas frequently performed as a gospel singer and was a speaker at church groups, youth groups, schools and colleges across the United States. One focus of her charitable work was speaking in support of various Christian children's homes, mostly in the American South. She appeared at conventions and trade fairs. She recorded several gospel albums, the first released in 1982, and recorded a few minor country music records during the 1970s and 1980s. Douglas wrote and published a religious-based children's book titled Donna's Critters & Kids: Children's Stories with a Bible Touch. The book included Bible stories featuring animals combined with a coloring book. In November 2011, she released a new children's book titled Miss Donna's Mulberry Acres Farm. In 2013, Douglas published a cookbook, Southern Favorites with a Taste of Hollywood which collects recipes of Southern cooking from show business friends and colleagues such as Buddy Ebsen, Phyllis Diller, Valerie Harper and Debbie Reynolds. The book also has a section on good manners called "Hollywood Social Graces". Douglas married her first husband, Roland Bourgeois, Jr., in 1949, with whom she had her only child, Danny Bourgeois, in 1954. The couple divorced that same year. She married Robert M. Leeds, director of The Beverly Hillbillies, in 1971; they divorced in 1980. Douglas remained a close friend of Buddy Ebsen for 32 years. In a 2011 interview with The Lincoln Times-News, she described Ebsen as "a wonderful man, very much like my own father, a quiet, reserved, and caring person". In 2003, Douglas' mother, Elma Smith, and Buddy Ebsen died. Douglas and Baer visited Ebsen in the hospital, and following his death both delivered a eulogy at his funeral. A decade later, Douglas revealed the depth of her feelings for Ebsen in an interview with "Confessions of a Pop Culture Addict": "I loved Buddy Ebsen. He reminded me so much of my own dad. Most of my scenes were with Buddy, and most of Max's with Irene. Buddy was just a wonderful man. I related to him so easily. The night before he died, Max and I went up to the hospital to see him." On June 10, 1993, Douglas and her partner Curt Wilson in Associated Artists Entertainment, Inc., filed a $200 million lawsuit against Disney, Whoopi Goldberg, Bette Midler, their production companies, and Creative Artists Agency claiming that Sister Act was plagiarized from a book, A Nun in the Closet, owned by the partners. Douglas and Wilson claimed that in 1985 they had developed a screenplay from the book. The lawsuit claimed that there were more than 100 similarities and plagiarisms between the movie and the book/screenplay owned by Douglas and Wilson. The lawsuit claimed that the developed screenplay had been submitted to Disney, Goldberg, and Midler three times during 1987 and 1988. In 1994, Douglas and Wilson declined a $1 million offer to settle the case. The judge found in favor of Walt Disney Pictures and the other defendants. Wilson stated at the time, "They would have had to copy our stuff verbatim for us to prevail". On May 4, 2011, Douglas filed a federal lawsuit claiming that Mattel and CBS Consumer Products used her name and likeness for a Barbie doll in the Classic TV Collection without her authorization. The suit alleged that packaging for the "Elly May" Barbie doll featured a photo of her portraying the character. She maintained that she had never endorsed the doll nor given Mattel permission to use her name to promote its sale, and she sought $75,000 in damages. She claimed that CBS and Mattel needed her approval to design the doll, while CBS and Mattel maintained that they did not need her consent or approval because the network held the exclusive rights to the character. It was settled on December 27, 2011, and details were confidential, but both sides claimed to be content with the outcome. In addition to her frequent traveling for celebrity appearances and speeches, Douglas enjoyed gardening, spending time with friends and family, and answering her fan mail. Douglas died at Baton Rouge General Hospital, aged 82, on January 1, 2015, from pancreatic cancer. Her interment was in East Feliciana Parish, Louisiana's Bluff Creek Cemetery. Charlene Smith, Douglas' niece by marriage, said that Douglas returned to live in East Baton Rouge Parish in about 2005: "She was always happy, always beautiful. You always saw her with all her makeup on. She never looked her age." Smith said that at Christmas 2014 Douglas gave her a Bible that she had signed. Douglas often added scriptural verses to her gifts. Bachelor Father (1959) as Alice in episode "Kelly's Secret"
U.S. Marshal (1959) as Joyce Markham in episode "Trigger Happy"
The Twilight Zone (November 11, 1960) as Janet Tyler in episode "Eye of the Beholder" and (May 25, 1962) as Woman #1 in episode "Cavender Is Coming"
Lock-Up (1960) as Gloria Larkey in episode "The Case of Dan Gray"
Whirlybirds (1960) as Girl in episode "Four Little Indians"
The Detectives Starring Robert Taylor (1960) as Sandra Hoyle in episode "Alibis"
Route 66 (November 2, 1960) as Model in episode "Layout at Glen Canyon"
Thriller (January 3, 1961) in episode "The Hungry Glass"
77 Sunset Strip (April 28, 1961) as Rhoda Sheridan in episode "The Celluloid Cowboy"
Hennesey (May 22, 1961) as Sheree in episode "His Honor, Dr. Blair"
The Aquanauts (1961) as Nancy Gard in episode "The Stakeout Adventure"
Michael Shayne (1961) as Dusa Quick in episode "Murder Is a Fine Art"
Dr. Kildare (1961) as Jenny in episode:"Second Chance"
Mister Ed (three episodes, 1961–1962) as Jane Parker in episode "The Busy Wife"
Sam Benedict (1961) as Francine in episode "Hanigan"
The Defenders (1964) as Mary Andrews in episode "Drink Like a Lady"
Night Gallery (January 26, 1972) as Mildred McVane in episode "Last Rites for a Dead Druid"
Adam-12 (1972, season 5) as Nina Draper in episode "18 — The Beast"
McMillan and Wife (January 6, 1974) as Barmaid in episode 5 "The Man Without a Face"
The Nanny (March 31, 1999) as herself in episode "California, Here We Come"
^ Her father's obituary, published in Baton Rouge Advocate, October 9, 1988, states the following: "Emmett R Smith Sr. — Died 2:30 p.m. Friday, October 7, 1988, near Port Allen, as the result of a boating accident. He was 81, a native of Baywood and resident of Zachary. He was a retired Standard Oil Co. employee with 37 years service. Visiting at Galilee Baptist Church, Deerford Road, 12:30 p.m. to religious services at 2 p.m. Sunday, conducted by the Rev. Tommy Jackson. Burial in Bluff Creek Baptist Church Cemetery, Bluff Creek...."
^ Her mother's obituary, published in The Baton Rouge Advocate, January 2, 2004, states: "SMITH, ELMA ROBINSON In her early life, she was a telephone operator and was a joy and blessing to all who knew her. She died Wednesday, December 31, 2003, at 6:05 a.m. at Zachary Manor Nursing Home. She was 93, born in Olive Branch/Clinton and a resident of Zachary. Visiting was at Charlet Funeral Home Inc., Zachary, from 5 p.m. to 9 p.m. Thursday, with recitation of the rosary at 7 p.m. Visiting at St. John the Baptist Catholic Church from 10 a.m. until service at 1 p.m. Friday, conducted by the Rev. Kenny Laird. Burial in St. Isidore Catholic Church Cemetery, Baker..."
^ Cox, Stephen (2003). The Beverly Hillbillies: a fortieth anniversary wing ding (Rev. and expanded. ed.). Nashville, Tennessee: Cumberland House. ISBN 1-58182-302-9. ^ a b c d e f Thomas, Nick (October 1, 2013). "Elly May offers up some vittles with her stories". Senior Voice. 36 (10). Retrieved January 2, 2015. ^ a b Stout, David (January 2, 2015). "Donna Douglas, the Fairest 'Beverly Hillbilly', Dies at 82 (sic)". The New York Times. Retrieved January 2, 2015. ^ Brennan, Sandra. "Donna Douglas". AllMovie. Archived from the original on February 2, 2011. Retrieved January 2, 2012. ^ Pink, Douglas (June 12, 1994). "A FEW MOMENTS WITH... Donna Douglas Elly May Still Loves Her Critters". Orlando Sentinel. Retrieved January 2, 2012. ^ "Donna Douglas". Filmbug. Retrieved January 2, 2012. ^ a b Moore, Frazier (January 2, 2015). "Donna Douglas, 'Beverly Hillbillies' Star, Is Dead". ABC News. Retrieved January 2, 2015. ^ "The Hungry Glass (January 3, 1961)". Internet Movie Database. Retrieved January 2, 2015. ^ a b "Donna Douglas, actress - obituary". 22 October 2017. Retrieved 22 October 2017 – via www.telegraph.co.uk. ^ a b "Critters and Confessionals: A Conversation with Donna Douglas". popcultureaddict.com. Retrieved December 7, 2014. ^ "The Beverly Hillbillies last episode". tvseriesfinale.com. 27 September 2009. Retrieved 22 October 2017. ^ a b McConnaughey, Janet (December 29, 2011). "Settlement in Elly Mae Clampett Barbie doll suit". Bloomberg BusinessWeek. Associated Press. Archived from the original on January 8, 2012. Retrieved January 2, 2012. ^ "Southern Favorites with a Taste of Hollywood". Tate Publishing and Enterprising, LLC. Tate Publishing and Enterprising, LLC. Archived from the original on January 3, 2015. Retrieved January 3, 2015. ^ "Donna Douglas talks 'Hillbillies,' faith". lincolntimesnews.com. Retrieved December 7, 2014. ^ Haring, Bruce (11 June 1993). "$200 mil suit targets 'Sister Act'". variety.com. Retrieved 22 October 2017. 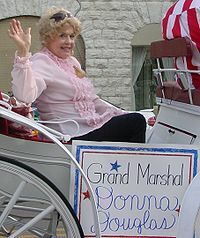 ^ "'Beverly Hillbillies' Actress Donna Douglas Dies at 82". The Hollywood Reporter. January 2, 2015. Retrieved 2015-01-03. Donna Douglas, best known for her role as the tomboy, critter-loving Elly May Clampett on the 1960s fish-out-of-water CBS sitcom The Beverly Hillbillies, died on New Year's Day. ^ Stegall, Amber (January 2, 2015). "Donna Douglas, aka Elly May Clampett, passes away at age 82". Pride, LA: WAFB. Retrieved January 2, 2015. ^ a b John Wirt and Andrea Gallo (January 2, 2015). "Donna Douglas, who played Elly May Clampett in 'The Beverly Hillbillies,' dies: Louisiana native known for spirituality, love of animals". Baton Rouge Advocate. Retrieved January 3, 2015. Interview (March 2014), amestrib.com; retrieved January 4, 2015. Donna Douglas profile, Aveleyman.com; retrieved August 13, 2015. This page is based on the Wikipedia article Donna Douglas; it is used under the Creative Commons Attribution-ShareAlike 3.0 Unported License (CC-BY-SA). You may redistribute it, verbatim or modified, providing that you comply with the terms of the CC-BY-SA.